The first shot of Oliver Stone’s pro football opus “Any Given Sunday” is the pigskin and its conspicuous Wilson trademark, the game and the game’s commercialization standing hand-in-hand. The ball is clutched by taped, bleeding fingers and then snapped to a quarterback who we see first not in a full shot but in close-up, his frenzied eyes scanning the field. Stone gives these instants a religious grandiosity, emblemized in another shot not long after, the camera looking straight up from below the goalposts at the sun streaming down from the clouds, as if the Almighty is watching, which I assume the team preacher – “I got out my playbook” he says clutching the Bible and quoting Scripture after the loss – believes is true. This entire opening, as the Miami Sharks - a fictional NFL-ish franchise - wage gridiron war, is bravura filmmaking by Stone, ever the moviemaking maximalist, who empties out his bag of tricks, employing Zuul-like growls on the soundtrack as linebackers bear down on quarterbacks and then cuing up strings when he cuts to the owner’s box where poodles are pet and Chablis is drunk. When the Sharks’ veteran quarterback Cap Rooney (Dennis Quaid) is hit and injured, Stone cuts directly to a Metrix commercial, a reminder that even a player’s gruesome injury is an advertisement, and when Cap, against the advice of his medical betters, climbs to his feet and hobbles off the field rather than going by stretcher, Stone calls on a jubilant processional melody, as people cheer. In other words, he is a warrior sacrificed for the greater good of the people buying tickets to massage the ego of the owner’s box. This is “Any Given Sunday” in capsule, brutal, entertaining and operatically unsubtle, where the field is simultaneously a triage station and a modern Colosseum. Stone, however, is not content simply with documenting on-field action; he goes off the field, mining drama for the innumerable maneuverings that contribute, for better and much, much worse, to this gladiatorial Sunday afternoon spectacle. The paradox, however, is that the film has both too many characters and no characters that are inessential, meaning that even if the film feels over-long and over-heated, it is nonetheless effective and entertaining. A myriad of satellites are made to orbit around Tony D’Amato (Al Pacino), legendary coach of the Sharks, whose dialogue is conveyed almost exclusively in shouting matches or clandestine whispers, aside from occasionally heartfelt conversations with Mandy Murphy (Elizabeth Berkley), who happens to be a lady of the night, meaning even their gravity is fogged up. 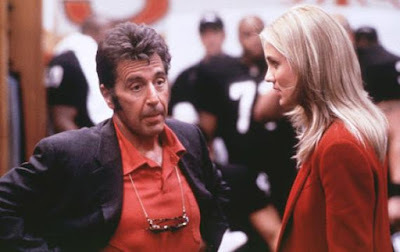 But you can hardly blame D’Amato for just wanting some talk that sounds real as he is forced to navigate an organization of surreptitiousness, as the team’s owner, Christina Pagniacci, played by Cameron Diaz with a rich girl fury, tries use the threat of moving the team to L.A. (sound familiar?) to get the city of Miami to finance a new stadium, and who also pressures the team’s physician, Harvey Mandrake (James Woods), to lie about certain players injuries. Diaz chews through scenery as a woman in a man’s world, of which there is something to respect, even though she is as cutthroat as all the rest of ‘em. There is something righteous and equally disturbing about the moments she parades into the locker room – righteous because she’s winning at a man’s game; disturbing because she’s a white person lording over a plethora of black men whom she willingly sends out to injury for the sake of her own amusement and pocket book. Mandrake, played with textbook slithery oil by Woods, is a villain, sure, putting players like linebacker Shark Lavay (Lawrence Taylor) in harm’s way, yet simultaneously the one acting with a bizarre candor. If D’Amato harangues him for ethics, it’s only, in Mandrake’s estimation, because the coach is in denial. “These men are gladiators!” Mandrake declares. “Warriors! And long ago, they made that choice, not me, not you.” It’s a speech that comes coated in the stench of save-my-job B.S., but it’s also not wrong, and reminded me of the same attitude one Barack Obama copped to having about the whole deal not long ago.” “There’s a little bit of caveat emptor,” he said of pro football. “These guys, they know what they’re doing. They know what they’re buying into. It is no longer a secret. It’s sort of the feeling I have about smokers, you know?” Or as Mandrake puts it: “Getting killed? Maybe, maybe not, it’s one chance in a thousand, but nobody blitzes like The Shark, right, Tony?” In that line is the NFL and our entire relationship to it, even POTUS. D’Amato, of course, is no paragon of virtue, telling Cap, “You just need the needle”, shrugging off his vet’s admission of blank spots in his memory and having Shark sign a waiver to go put himself at grave risk. Meanwhile D’Amato also must traverse a quarterback controversy between Cap, the stalwart vet, revealed behind the curtain to be a fragile King of Scotland to Lauren Holly’s vicious Lady Macbeth, and Steamin’ Willie Beamen (Jamie Foxx), who, in retrospect, was Michael Vick the very same year Michael Vick’s star was first beginning to rise in college. Beamon’s arc is unbelievably swift – he goes from throwing up in the huddle to recording a rap video in what’s, like, a week and a half. And yet even if its narrative logic seems wrong, it’s actually just right, a perfect expression of the meteoric rise and fall and rise and fall, etc., in the sports world, where Heroes & Villains move at warp speed. Perhaps the film’s best scene is also its most dire and most histrionic, Beamen meeting with D’Amato at the Coach’s home. Stone lays it on thick, thunder rumbling in the distance and a big screen on the premises reveling in violent flashes of “Ben Hur”, as D’Amato and Beamon hash out everything, from Beamen’s place on the team to a black man’s role in the game to rules that get broken because the rules are antiquated hogwash to the advent of a new century and a new brand of football. This whole gonzo scene is like a soliloquy for what football was, or what it masqueraded as, and what it would become, and what it pretends to be, and D’Amato is powerless to stop it just as Beamon, despite all posturing to the contrary, isn’t quite ready for it. Eventually all this builds, as it must, to the Big Game, though it’s not the Biggest Game, just a playoff game where mettle will be tested, and with the myriad of issues Stone has brought to the forefront, “Any Given Sunday” is primed to explode into a refutation of its titular cliché. Behold, it doesn’t. 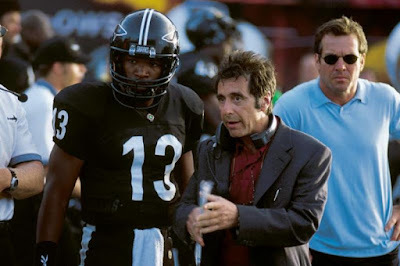 Instead Stone has Pacino unleash a pre-game locker room oration registering 800 megatons on the cinema speech scale. It’s spellbinding...and it’s full of clichés. It’s everything Stone has been rejecting for two hours suddenly served sincerely with Pacino’s patented holler. And the game that follows – the Sharks falling behind, and coming back, and Cap standing down so Beamon can stand up, and Shark suffering a concussion before he heroically comes to, and a final play that Stone majestically draws out to Moby’ “My Weakness” like it’s the most important moment that ever has and ever will be which in that moment is exactly what it is – is the zenith of football’s romanticism, where winning washes away all ills, where the injured have served the greater good even they suffer a lifetime for it, and we are disgusted even as we simultaneously embrace the holy hell out of it. It’s too much, but we can’t get enough. It’s our weakness.